Dr. Anthony Jenkins of West Virginia State University urges crowd members to look to the future and remember the trials and tribulations US citizens had come through to make the country what it is today. 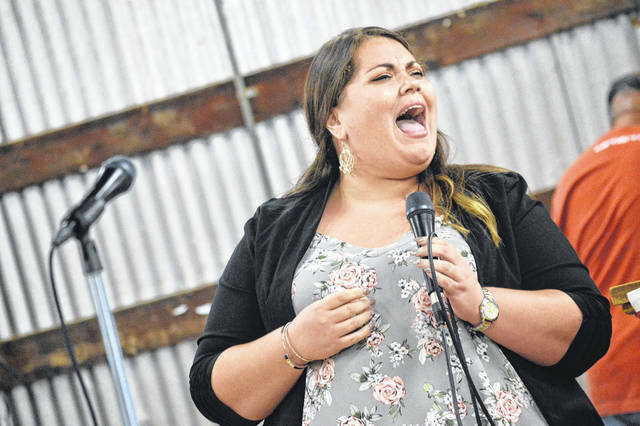 Chelsea Price demonstrates her vocal talents. GALLIPOLIS — The Emancipation Celebration Weekend returned this year to the Gallia County Junior Fairgrounds Sept. 22-23 with West Virginia State University President Dr. Anthony Jenkins serving as its keynote speaker. Anthony L. Jenkins, Ph.D., West Virginia State University’s eleventh president effective July 1, 2016, is an established higher education leader committed to advocating for students and creating opportunity to higher education for all students, especially culturally under-represented groups, say supporters. 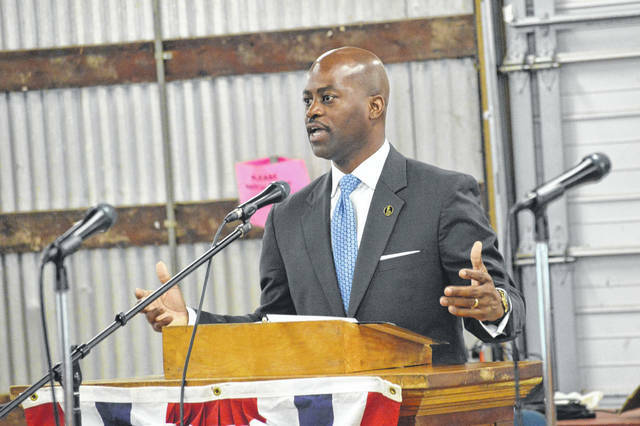 Jenkins began his path to West Virginia State University as a United States Army veteran and first-generation college graduate. Jenkins earned a Ph.D. in Educational Leadership and Policy Studies from Virginia Tech University, a Master of Science degree from North Carolina Central University, and a Bachelor’s of Applied Science degree from Fayetteville State University. “When you think back before about all the changes and obstacles we as a country have overcome, we have all come too far to turn back and we are too close to give up,” said Jenkins referencing the decisions made by President Abraham Lincoln, Dr. Martin Luther King, Jr., and the thousands of activists and soldiers who had sacrificed in the name of equality and freedom. “While we look across our nation and we see conversations that may not be collegial, and some may believe that we are closer to the finish line than we are to the starting line, I challenge us now is not the time to get weary,” said Jenkins to the crowd.